It is a combination of both flocculation and clarification in a single unit. Clariflocculator basically consists of two concentric tanks with inner tank serving as flocculation basin and outer tank serving as clarifier. The chemically dosed water is uniformly distributed over the surface of the flocculation compartment for effective utilization of the available volume for flocculation. The specially designed flocculating paddles enhance flocculation of the feed solids. As heavy particles settle to the bottom, the liquid flows radially outward and upward and the clarified liquid is discharged over a peripheral weir into the peripheral launder. 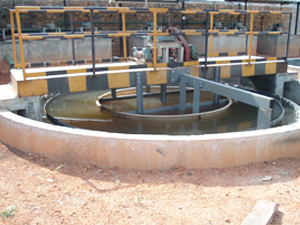 The deposited sludge is raked to the bottom near the central pocket from which it can be easily discharged.